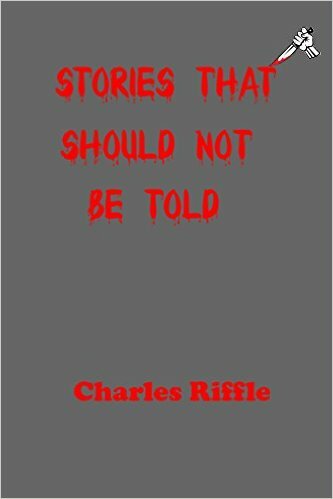 STORIES THAT SHOULD NOT BE TOLD by Charles Riffle. 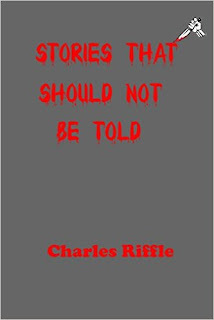 A collection of horror/suspense short stories with a twist of comedy. A young man travels to the past (with the help of a magical trucker's cap) in an attempt to save his slain girlfriend, Are you prepared for the Stink Bug Apocalypse?, A bumbling but competent FBI Agent tracks a serial killer with the help of an eccentric informant, A supernatural expert recalls his ghost hunting days with a pair of odd brothers and other stories of horror and absurdity. This was such a fun book for me to read . I love horror books but this book had horror and comedy. The first story had me laughing out loud because I had a bug problem at on time. It made me think back and laugh. The first story THE INFESTATION , you all know you hate them the stink bugs that invade areas every year. The characters in this story are just ordinary everyday citizens . It shows how one man's hysteria can take on a life of its own . Just get a few people to follow and you can get Armageddon . It is a very well written story that will make you giggle in some parts cause we have all been there with bugs . The third story GARY'S DAY OFF . Is about a guy that doesn't like his job but is working long hours cause he likes the people . On his day off he has the worst day of his life. He ends up demon hunting at the old folks home . Gary is one pissed off LPN . The third story SPECIAL AGENT RICHARD PETERS in the Case of the FRUGAL KILLER. Is the story of a serial killer and the FBI agent that is chasing him. But it has a twist . Richard Peters is an agent that is constantly being harassed by his partners , he is sent out to catch the frugal killer This one takes you on a run around and in the arms of serial killers. Its a take off on Hansel and Gretal as he ends up on a butcher block . Won't tell you anymore but just imagine what is going on. The fourth story THE FAN . Is about a young man kidnapped and is going to die . But all he can talk about is paying his cell bill. He just doesn't get the fact that he is about to die. He becomes a fan and drives the killer crazy by asking tons of questions. I laughed so hard reading this one story , cause you can just picture the killer shaking his head while his prey drove him crazy. The fifth book THE BROTHERS BEEF , This short is about three guys that go ghost hunting . The way they go about it is pretty funny . Donnie doesn't know what he is getting into . He thinks he going to clean pools. Reading this story reminds of GHOSTBUSTERS and how they go about it . It was a great story to read and I loved it . The last story is ALEKZANDER VON THIRTENBURG. Let me introduce you to Alekzander the best vampire that ever lived . In his opinion that is. He has survived the stake and the holy water . He decides to take a trip to America. Where he can't believe the fashion and getting assaulted And the poor vampire's day get even worse. I felt so sorry for poor Alekzander . I laughed and laughed . Over all I really liked these stories . They are well written and flow very easily . The characters remind me of people that I know . Especially in the infestation . I had a blast reading this book . I was finished it in an evening . I laughed and had a great time reading . So if you want a great horror book with an element of comedy mixed in. This is a great book if you love to laugh with your horror.